I would so very much love to read this article on Shinjuku Station. Hélas, it is behind a paywall. 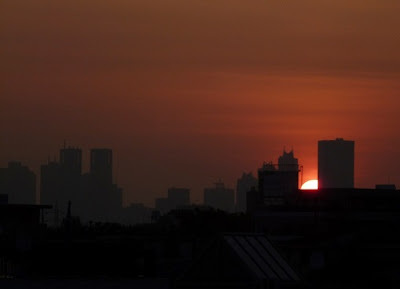 It would be refreshing to see Shinjuku Eki through an outsider's eyes again. I would also very much like to learn how the station is a troubling mirror of Japan. I confess...due to various reasons, I could not negotiate Shinjuku Station during my first decade of residence in the Tokyo Metropolitan District. How higgledy-piggledy is Shinjuku? This is JR East's exploded view of just the JR section of the station and this is one individual's inadvertently hilarious attempt to annotate the JR East map so as to clarify the connections between the JR section of the station and the other sections. That easiest way to slice through the labyrinth is to place the West Exit's taxi roundabout at the center and bottom of one's mental map, then draw radial compass lines toward all the other main points in the station, did not occur to me until sometime around 2005. If I get a chance to read the Le Figaro piece, I would likely profit from a non-English language reading of locations in Japan. Almost all my views of this blessed land come via Japanese or English language sources -- with some vicarious readings of Italian views via Italian readers in Tokyo (Grazie tanto!). That one has to venture outside the bilingual (Japanese-English) intellectual hegemony on Japan studies was clear a few months back in the disastrous interview Tokyo Metropolitan District governor Inose Naoki had with Ken Belson of The New York Times. Misunderstandings in the conduct and interpretation of that conversation seriously dented Tokyo's chances of landing the 2020 Olympic Games. At several points in the interview, Inose said that Japanese culture was unique and by implication superior, a widely held view in Japan. He noted that the political scientist Samuel P. Huntington wrote in his book "The Clash of Civilizations and the Remaking of World Order" that Japan was unlike any other culture. Tokyo, he added, is exceptional because the Imperial Palace, which is largely off-limits to residents and visitors, forms the city's core while bustling activity surrounds it. "The central part of Tokyo has nothingness," he said. "This is a unique way that society achieved modernization." The underlined sentence is the kind of vaulting non-sequitur that earns The New York Times the ire of Japan defenders. If Governor Inose did not say that Japanese culture is superior, one should not report that he did. More interesting is the replication, without explanation, of the assertion (in bold) that the green oasis of the Imperial Palace grounds, much of which is impenetrable to the citizenry, is symbolic of this blessed land's unique passage to modernity. If there was ever a statement that needed explanation, it was this one -- particular because the observation is not Japanese in origin. The improbability of the verdant and closed-off Imperial Palace grounds (the grounds are not all closed off, of course, the East Gardens being one of the truly great green public spaces in the 23 Wards) being the center of a metropolis is the signature observation in L'Empire des signes by Roland Barthes (Link - Fr). Inose assumed that Belson, an educated Westerner with ties to Japan, would be familiar with Barthes' work. In referencing both Barthes and Huntington, Inose was demonstrating that "uniqueness," far from being a marker of Japanese prejudice and arrogance, was indeed the almost exact opposite, "unique" being the adjective to which non-Japanese thinkers, befuddled by the challenge Japan's culture and history presented to their world views, have repeatedly retreated in their hour of intellectual aphasia. For those who are interested and do not read French, L'empire des signes has been translated into English (Link). As it is a part of the French literary criticism/semiotics tradition one will not often find the work on the syllabi of positivist tradition English language Japanese studies courses. Nevertheless, it is one of the canonical works in the Japanese intellectual tradition of the ways non-Japanese look at Japan. Which is as twisted and non-intuitive as the maze of underground passages beneath Shinjuku Station. I could access the article in your link without problem or any pay-wall. Maybe it has been updated and you should try again. Thank you for the notice. Le Figaro has indeed released the hold it had on full text...and too bad! The article does not fulfill the promise of the title, unless the reader is supposed to find punctuality, convenience and crowding "troublant." Mon Dieu! The map accompanying the article places Shinjuku Station at Tokyo Station. Quel bordel! I would not and could not rely on French media sources for "reading Japan" except for Philippe Pons, long time correspondant of Le Monde. The rest are appalling rewriters of news agencies or happilly just landed for a few days journalists in weird Japan. The coverage of the French president in Japan recently was a journalistic shame. Barthes was one of my key entry point to Japan more than 35 years ago. "Japon Expo" is the contemporary phenomenal main gateway to "Japan" heavily marketised as a weird and wondrous product in a very French way. As with everything, there are exceptions, but when it comes to Japanology, English sources rule. I could not seriously read Barthes today but as a canonical lens and peep into the French totemic way of seeing Japan, it still plays in the background. To me, not speaking and reading Japanese brings the value of any commentator of Japan to an anecdotal level. The fact is that short time visitors of the local zoo refering to Them, the Japanese, as some panda species, have always grabbed the limelight. Nowadays, "Japan as seen through my Westerner navel" is also a feature of somewhat long time resident unavoidable French authors fairly fluent in Japanese and orbiting around the French embassy in Tokyo. Marketing and vested interests are however strong factors here one cannot ignore. But as authors they can be ignored. If not for Fukushima revealing the depth of involvement between France and Japan in matters of nuclear, one could be stuck, as many are, with chefs using yuzu in fashionable cakes, the Michelin guide of Tokyo and everything manga. Of course, I am summarising so much that it sounds like a caricature. It is more complicated than that and features many side walks and exits, but not as much as Shinjuku station for which I have developed my own mental map. Took me about 3 months to figure out how to navigate around Shinjuku Station with ease. Try this book. It's got some pretty cool 3D cross-sections of these modern-day "dungeons" and some expert tips on how to efficiently navigate through them. Funny. I accept our Shinjuku Station experience, but I always found it intuitive, if huge and otherwise daunting. I am a visual thinker, not to say that you are not. For some reason; however, the much smaller Kita-Senju Station I cannot wrap my head around: mainly the connections between Chiyoda/Joban and Hibiya/Tobu platforms.